Following multiple delays, South Park: The Fractured But Whole is now scheduled to release on October 17 in North America and Europe for PlayStation 4, Xbox One, and PC, Ubisoft announced today. Pre-ordering The Fractured But Whole gets you a free copy of South Park: The Stick of Truth (offer expires January 31, 2018) as well as an exclusive in-game assistant, Towelie: Your Gaming Bud. At key locations in the game, Towelie: Your Gaming Bud will provide advice and commentary. 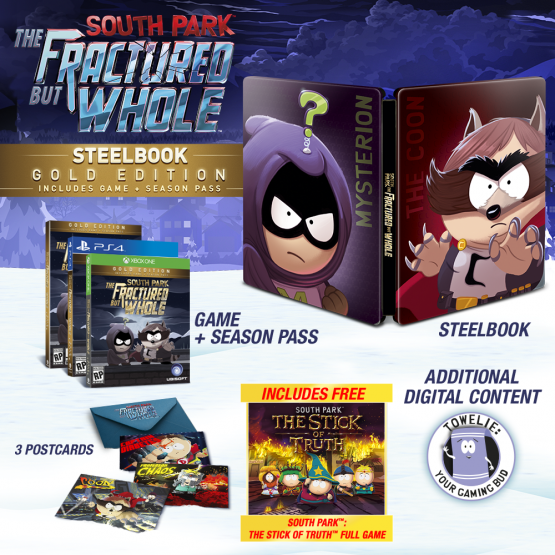 There are five editions of The Fractured But Whole available: Standard, Gold, Steelbook Gold, Collector’s Edition Standard, and Collector’s Edition Gold. The Season Pass is included with the Gold editions. The 21st season of South Park premieres on August 23.